But with the government due to run out of money at midnight Thursday, the fate of the greater sage-grouse and Gunnison sage-grouse probably won’t be the deciding factor on whether Congress passes the deal or President Barack Obama signs it. Instead, the humble bird is just another example of how Washington gets business done, with industry, environmentalists, pro- and anti-regulation advocates and lawmakers from both parties trading chits on issues like school nutrition, sleep rules for truckers and D.C.’s marijuana laws. With this fight, the sage grouse has joined a roster of creatures like the spotted owl, the snail darter and the Delta smelt in becoming flash points for Beltway collisions between conservation and business interests. The oil and gas industry’s supporters, who include both Republicans and Democrats, say they just wanted to keep the Interior Department from acting on grouse protections before all sides can agree to a solution. By blocking the grouse safeguards, the measure will “make sure that there is ample time to discuss it and get to a good solution,” Sen. John Hoeven (R-N.D) said Tuesday. Congress stepped in “to delay an arbitrary listing deadline and give more time for state and local conservation efforts to show their effectiveness,” Western Energy Alliance spokeswoman Kathleen Sgamma said by email. Oil and gas companies, along with farming, forestry and recreation interests, are wary of federal grouse protections that they warn could short-circuit states’ more development-friendly habitat safeguards. State-based plans “provide more certainty to oil and natural gas producers, rather than the one-size-fits-all approach that the federal government is on a path to impose,” Sgamma said. Just this week, drillers’ fears about potential sage-grouse protections caused bidders to stay away from a federal sale of oil and gas leases in Nevada, The Associated Press reported. Interior’s Bureau of Land Management sold just one parcel out of 97 offered. “As we’ve seen just this week with the low-yielding BLM lease sale in Nevada, independent producers are concerned that a future federal listing of the sage-grouse would harm existing state-based conservation measures already in place to protect the bird, while simultaneously ignoring the great strides America’s energy industry has taken to reduce surface impacts and enhance conservation of the sage-grouse in the West,” Dan Naatz of the Independent Petroleum Association of America said in a statement. But conservationists like Audubon’s Rutledge accused lawmakers of “ignoring scientific input” about the plight of the birds, which have seen their range dwindle as development expands across the region. Only about 5,000 breeding Gunnison sage-grouses still exist, Interior’s Fish and Wildlife Service says, while the greater sage-grouse has a population between 200,000 to 500,000. Among green groups, only the Environmental Defense Fund stopped short of condemning the rider, saying it means Western states must act aggressively and quickly on conservation measures. Interior Department spokeswoman Jessica Kershaw criticized Congress’ intervention but said the agency will continue trying to come up with an agreement to save the species while accommodating other interests. 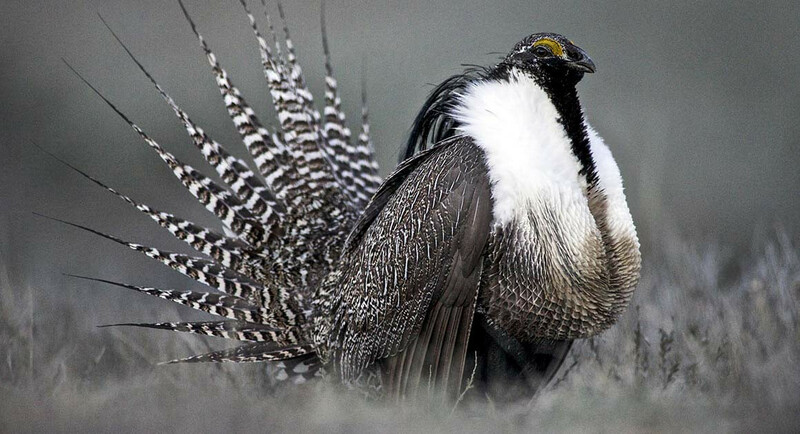 Interior is under a court deadline to decide by September about an Endangered Species Act listing for the greater sage-grouse, and last month it settled on a status of “threatened” for the Gunnison sage-grouse. Gov. John Hickenlooper (D-Colo.), whose state is a growing oil and gas producer, has vowed to sue over the latter decision. Interior Secretary Sally Jewell told the Western Governors Association last weekend that she hopes to work with states and other groups to create strong enough conservation measures to avoid listing the greater sage-grouse. But the fact that the spending deal expires Sept. 30, close to Interior’s court deadline, “could put this thing right back in the courts,” the lobbyist said. Both the Gunnison and greater grouse are about the size of chickens and have striking speckled tail plumage. The sage grouse is known for a mating ritual in which males pop curvaceous air sacs with a ziplike sound that can be heard two miles away. The birds’ finicky nature presents significant challenges to locals who have taken major steps to avoid disturbing them. Among other accommodations people have made for the birds, developers have changed the direction of bathroom windows on new homes because the predawn light would upset mating dances. One lawmaker interested in the issue is Sen.-elect Cory Gardner (R-Colo.), who signed on to House legislation this year that would block endangered-species listings of the sage grouse for 10 years but require states to develop conservation plans. He said he has spoken to Interior about the issue but not in recent weeks.